The story of our stallion Caletino, known to his friends as “Seeker,” has been one of unique and fated circumstances from the moment we saw him continuing right through to his current foray into a new performance career. We have many stories to tell from his recent pairing with US team rider Rich Fellers, but a bit of history from the beginning makes it all the more interesting. In 2001, Deborah and Marvin were in The Netherlands and attended the KWPN Select Sale (KSS) with their partners in the KWPN stallion Nassau. They were bidding on the horse Rambo (aka Roussou). As luck would have it, one of the party at their table held up his hand, waiving to someone across the room, and the auctioneer took it as a bid on Caletino. By the end of the night, they had purchased the 1998 Holsteiner stallion. At first, Caletino remained in Holland. However, our European partners felt he lacked talent for jumping and asked if Deborah would like to take him to the US and train him for dressage. 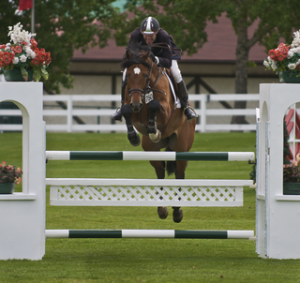 He came to the US as a three year old in the winter of 2001 and began his show career in 2003, becoming the USDF Horse of the Year Materiale during his first year of competition. In addition, he was the NWSHB Champion Stallion, Best of Breed, and the USDF Cosequin Champion Stallion. In 2004, he qualified and competed as a finalist in the US Young Horse National Championships in Lexington, Kentucky. Just one month later, he won the DG Bar Cup, an event for Dutch young horses. His score placed him as the Reserve Champion in the US. During the time of the US Dutch Inspection tour, Caletino had all of the results needed for approval, but unfortunately could not get to the approval site due to the passing of Deborah’s father. Meanwhile, Caletino remained in training under saddle for dressage, with free-jumping a continued part of his program. He and Deborah showed through 4th level and were training to show PSG during the 2007 show season when a quarter crack that occurred while playing in the pasture sidelined Caletino for just over 1 year. He came back to work but issues began to surface with the steep angles of the upper level lateral movements, due to the size of his testicles. Over time, Deborah noticed that the issue was better on colder days and more problematic on warmer days when he was dropped. Over these same years, Qauilhurst bred seven of our own foals from Caletino. We have backed and sold a few, still have a few, and one has recently returned for dressage training with his new owner. Caletino’s offspring all display the signs of his wonderful character and ridability. In early 2009, US team rider Rich Fellers, whose Rich Fellers Stables is based just minutes away from Quailhurst, came to look at one of Caletino’s offspring. While they were looking at Caletino, Deborah asked if Rich would take him into training, as she always believed that jumping would be part of the stallion’s plan.